At 28.7 m., in the Schoharie Valley, is the junction with State 30 (see Tour 24). On the northern edge of the village (R) an evergreen tree marks the grave of the 'Witch of Esperance.' According to the legend, during the Napoleonic Wars a French soldier brought his family to the village. Upon his death, his widow, unable to speak English and mingle with the villagers, became an object of suspicion and mystery and was called the 'Grenadier Woman.' At a solemn conclave in the stone church her neighbors decided she was a witch and voted her death. Her executioners fired a silver bullet molded from a teaspoon through the window of the widow's cabin and killed her while she cooked at the open fire with her children playing beside her. In 1838, in the same stone church..., Sheldon Jackson (1834-1909)... was baptized. Fifty years later he was appointed superintendent of public instruction in Alaska, and during his incumbancy he introduced reindeer to the territory as a food supply to end periodic famines among the Alaskan Eskimos. US 20 continues to Duanesburg, 21.9 m. (197 pop. ), named for James Duane (1733-97), jurist, land speculator, and mayor of Manhattan 1784-9. Described as 'plump of body... the dignity of his appearance enhanced by such luxuries as gold shoe and knee buckles,' Duane had a 'jolly good humor which quickly won him friends...' Just prior to the Revolution Duane was zealously aligned with the conservatives... He sat in the Continental Congress almost continuously until 1783, serving chiefly in connection with financial and Indian affairs... Duane's greatest nonprofessional interest was in land development. 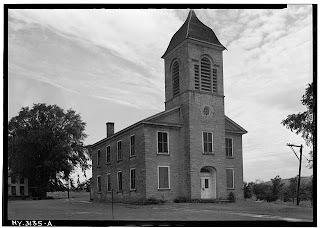 As an aside, if you're looking for photographs of historic buildings along US 20 (or other places as well,) try using the Historic American Buildings Survey at the Library of Congress' American Memory site. It is a treasure trove of very fine black and white photographs of American architecture! The survey started in the 1930s. 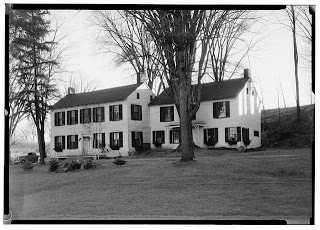 I've downloaded several images from there to use in this blog already, like the image of the Case Tavern in the entry below. In Guilderland, 9.4 m. (225 pop. ), is (R) the Schoolcraft House (private), an excellent example of the mid-nineteenth century fad, the Gothic Revival cottage. A yellow wooden structure, it is complete with carpenter fashioned buttresses, drip moldings and tracery. At 20.7 m. is the junction with a dirt road. Left on this road 0.3 m. to the North House (L), a square, two story frame structure of Georgian Colonial design built in 1784 by William North (1755-1836). 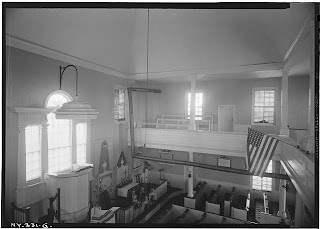 Born in Maine, North served during the Revolutionary War as aide to Baron Von Steuben, and later was adopted by Steuben... His grave is in Christ Episcopal Church Cemetery in Duanesburg. West of Albany US 20 follows roughly the old woods-roads andIndian trails over which the Tory and Indian raiders struck eastward during the Revolution, wiping out settlements and isolated homes. Over this same route rode nineteenth century Paul Reveres, hunting horns blaring, to call the antirenters together to fight the sheriff and his deputies. Just west of Albany, 0 m., is Mckownville, 5.8 m., a clambake and midget-auto racing paradise. Almost every weekend during the warm season, Albany clubs and organizations crowd McKown's Grove for a 'bake.' A cobblestone lined pit is filled with cordwood, which is burned until the stones are almost white hot. Then the ashes are swept out and the pit spread with a layer of fresh seaweed. Wire baskets, each filled with two dozen or more washed and selected clams, two clambake sausages, one-half chicken, one white and one sweet potatoe, and one or two ears of corn..., are set into the pit and the whole covered with a tarpaulin, edges sealed with wet clay. The steamed clams are supplemented by iced raw clans, bread, pickles and olives. On Sunday afternoons the Capital City Speedways sponsor midget auto races on the pear shaped quarter mile dirt track in McKown's Grove. The light, stubby cars, 500 to 900 pounds in weight, whirl 21 laps for the main event, their open exhausts clattering, adding din and dust to the general excitement. Albany (18' alt., 130,447 pop. ), capital of New York State, inland seaport..., is built along the edge of a plateau that extends 18 miles northwest to the Mohawk Valley... Although Albany is an important manufacturing and wholesale center, its personality is determined by its function as the capital of the state... It is this large group of office workers that gives Albany an essentially 'white-collar' appearance. The first permanent settlers, who came in 1624, were 18 families, mostly Walloons from Holland. They built a second fort on the site of the present river steamer landing and called it Fort Orange in honor of the ruling house of Holland. In 1630 Kiliaen Van Rensselaer, with two partners, purchased from the Indians land on both sides of the Hudson River and established the patroonship of Rensselaerwyck. The fur trade made Albany traders wealthy and intensified friction with the French. Control by the English of the interior and the fur trade of the Great Lakes area depended on their alliance with the Iroquois and the of the defense of the Colonial frontier, of which Albany was the key.